I’ve enjoyed gardening ever since I was 11 years old. My collection of garden tools isn’t very big, but I have all the things I need to make gardening a cinch and keep my plants green. Over my many years as a gardener, I’ve spent relatively little money to compile everything I need to enjoy this rewarding, refreshing hobby. I buy what I need, and it all starts with buying quality tools. 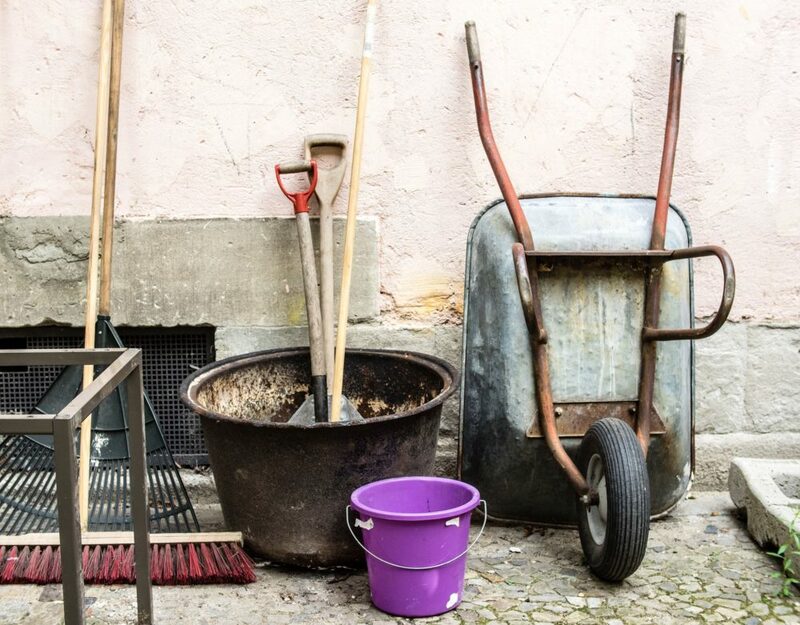 Garden tools aren’t an area where you should take the cheap route. Spend a little more than the “cheap” brands cost and you’ll have tools that, with proper care, should last you for many years. Personally, I’m a Craftsman and Stanley guy. I recommend you buy their garden tools and other products whenever you can — because I can attest to the fact that they last. Plus, their hand tools come with lifetime warranties. They are replaced for free if they break due to workmanship issues or regular, non-commercial use. No, I don’t own stock in either Craftsman or Stanley — I’m just a longtime gardener who has used those companies’ products for many years and am very satisfied with both the quality of their tools and their customer service! And, speaking of garden tools, below is my list of essential garden tools every good gardener needs. You should be able to buy everything listed here for less than a couple hundred dollars if you shop for the items during sales. TIP: There are lots of sales on garden tools during the spring and fall! And don’t forget to clip those home store coupons and check your local newspaper ads regularly to see when garden tools go on sale. Every gardener needs a spade — you know, that small, hand-sized shovel whose scoop is flattish and shaped like a triangle. Gardening spades are handy tools for all sorts of gardening needs. Spades are helpful for planting bulbs, digging holes for seeds, and removing those tougher weeds with aggressive root systems. A good spade should cost less than $20. 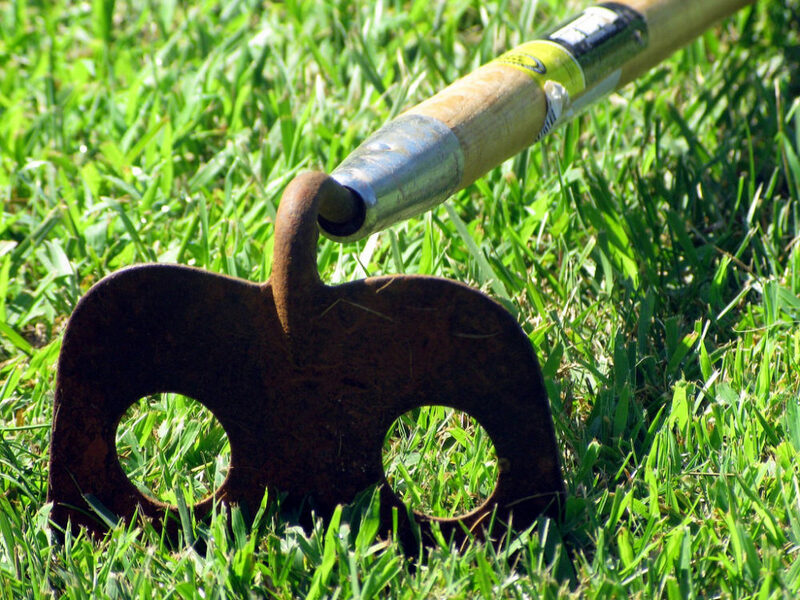 Here are some great tips to care for your garden shovels and spades. Garden forks are small, handheld rake-style tools that usually feature 2, 3, or 4 large, pointed prongs. The prongs are sharply bent at a right angle downward near the ends of the tines — to help pull up loose clods of dirt. I really don’t know where I’d be without a gardening fork, especially because some of the soil in my garden is hard-packed clay. The tines of the fork easily break up the soil, allowing me to mix in rich humus to help aid in the growth of my plants. A good garden fork shouldn’t cost more than $15 to $20. Here’s what to look for when buying a garden fork. Spades are great for planting bulbs, annuals in 4″ pots, or other small plants. But you should plan on digging holes for larger plants — like those in 1-gallon pots. If using a spade for the job, you’ll be 5 to 10 minutes digging that hole if the soil is soft… an hour if it’s hard. Don’t waste your time or give yourself a sore wrist digging large holes with the a too-small tool. Instead, dig those larger planting holes with a long-handled digging shovel. A pointed shovel with a large, scooped face can make swift work of digging large holes. I’ve dug some 3-gallon plant holes in well under 30 seconds with my digging shovel. My best tip here is you don’t want to buy a long-handled shovel that is liable to break easily. Wooden-handled shovels are sufficient for most home gardening tasks, but the wood can snap. If you’re buying a metal shovel, it will probably last longer but you’re going to spend a little more for it. Be sure you buy a shovel that’s ergonomically comfortable. Of all the tools I have, the digging shovel is probably the hardest on my body because large scoops of soil can easily weigh 10 to 20 pounds each — and that feels even heavier at the end of a long-handled shovel! Here are some great tips for using a shovel in the garden. Unlike the gardening fork I mentioned above, a leaf rake is good for preparing planting beds. There are rakes of every size and shape, but for the purpose of raking a plant bed, I like the plastic or pliable metal head rakes with wide faces and long, comfortable handles. These larger rakes are ideal for moving around and smoothing out a larger area of dirt at once. They’re also perfect for raking leaves and yard debris. An excellent leaf rake can be bought for under $25. 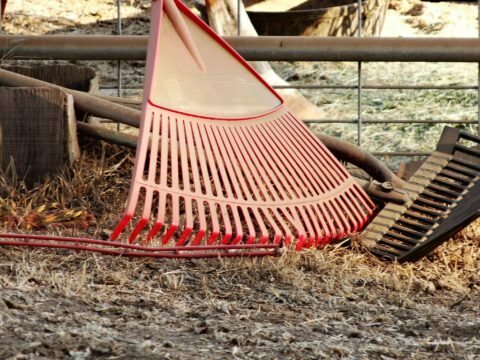 Here’s the easiest way to rake your yard. 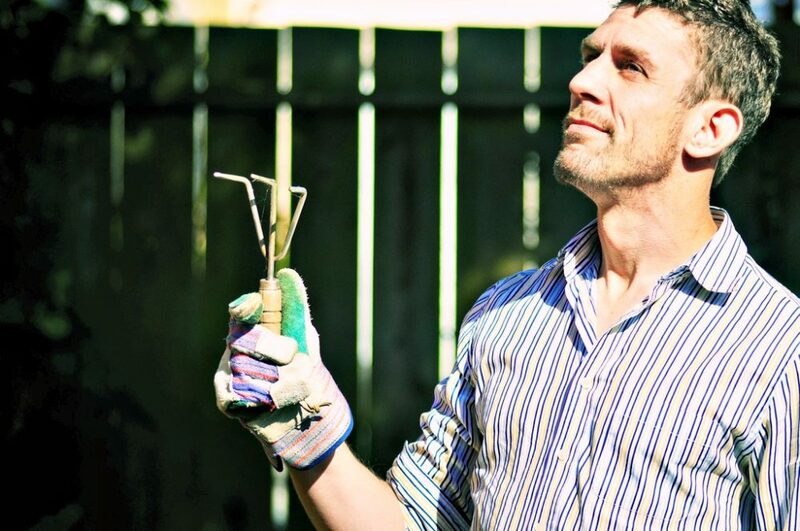 You really can’t do a lot of gardening without a good garden hoe. Without one, it would be like scrubbing hard floors with a toothbrush. Sure, a fork or spade are good for the small essential tasks, but have you ever tried weeding an entire garden or moving around lots of soil with only a spade and fork? A decent garden hoe will cost about $20, and a great one (with rubber handles, forged steel, and a wider head) will set you back about $30. Here’s how to hoe weeds. Shears are good for cutting back larger areas of plant growth. They’re typically used for cutting back or shaping shrubs and ornamental grasses, and cutting back flowering plants after blooming season. I’ve also used my garden shears for cutting back underbrush trees and larger ornamentals. $20 buys a good pair of shears, but $30 or $40 will get you a pair that will stand the test of time. Here are some great tips for selecting garden shears. Whether I’m working on a rose bush, maintaining a vegetable patch, or making a few cuttings from an annual or perennial, my pruners are always with me when I’m gardening. 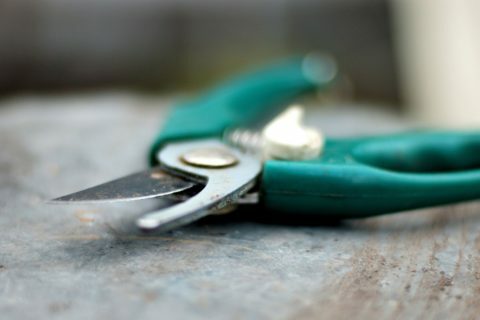 Pruners work something like shears, in that they can cut back overgrowth or allow you to remove dying buds or twigs, make cuttings, or maintain the shape of your plants. Unlike shears, pruners are smaller, they feature hook-shaped cutting blades, and they’re designed for more selective cutting. They’re more like miniature loppers. You can find decent pruners for $15, but if you spring for the really nice ones that cost $25 to $40, you’ll have made a lifetime gardening investment. Here are some handy pruning tips for gardeners from Fiskars. 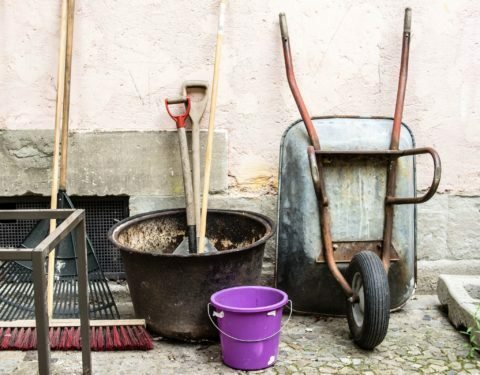 The 7 garden tools listed above are absolute necessities — you really can’t start or maintain a garden very well without them. Yard Bags – These large, heavy mill lawn bags are ideal for collecting yard debris. They’re also great to spread flat on the ground and use them as a place to deposit dirt upon when digging holes and such. Gardening Gloves – I regularly use garden gloves, especially after injuring my hand on some thorns years ago while weeding. Thick cloth gloves are great because they help prevent hand injuries while weeding or using hand tools for prolonged periods and still allow free movement of your fingers. Knee Pads – I like using knee pads when I’m bending forward in the garden — especially when digging holes for planting small plants with a spade or tilling the bed with a garden fork. Pots – If you live in an apartment and can’t establish plants in the ground, or simply prefer to keep your plants in portable containers, garden pots are the way to go. I like using clay pots whenever possible, but larger plants are better off in plastic pots — especially if you have to move the pots around often. A 25-gallon clay pot can feel like it weighs a ton, even when it’s empty! Potting Soil – If you’re blessed to live in an area where there’s lots of good, rich humus, you may not need to buy potting soil. Where I live, much of my soil is either sandy and loose or a bit more compacted and claylike, and either situation makes it hard to grow plants very well. I usually have to add potting soil to help enrich the existing soil, and I also use potting soil when preparing pots for plants. Sure! You could buy a wheelbarrow, a flat shovel for scooping dirt off surfaces, loppers for cutting back landscaping trees — even a lawn mower for mowing grass. The list goes on and on and on. But you don’t need all of that to get started as a gardener. 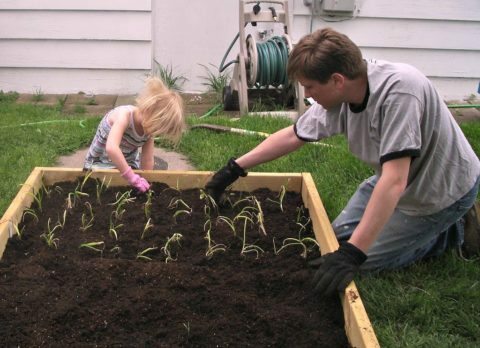 They’re great add-ons as you get more involved with gardening and need more handy help. But if you stick with the basic garden tools and supplies listed above, you should be off to a great start as a gardener and be able to handle most of the things that will come your way. May your garden grow ever big and your thumbs stay ever green!